ECo-AT (European Corridor – Austrian Testbed for Cooperative Systems) is the Austrian project to create harmonised and standardised cooperative ITS applications jointly with partners in Germany and the Netherlands. The project is led by the Austrian motorway operator ASFINAG and the consortium consists of Kapsch TrafficCom AG, Siemens AG Österreich, SWARCO AG, High Tech Marketing, Volvo Technology AB, ITS Vienna Region, FTW (Forschungszentrum Telekommunikation Wien) and BASt (Bundesanstalt für Straßenwesen). Within the next years C-ITS should be developed for beeing applied in the Cooperative ITS Corridor Rotterdam – Frankfurt/M. – Wien. This happens in close cooperation between the EU-member states Netherlands, Germany and Austria, who have signed a Memorandum of Understanding. Austria has established itself as constructive implementation pioneer of C-ITS applications within the European Union – not least because of the project Testfeld Telematik. 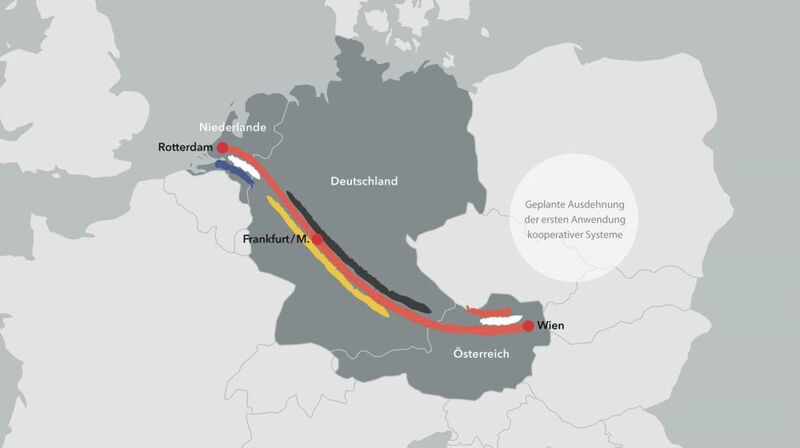 The next steps towards pan-European deployment in the european C-ITS Corridor from the Netherlands via Germany to Austria will be prepared and developed within the project ECo-AT for the Austrian section. From 28th to 30th of July 2016 the 4th ECo-AT Test Cycle took place with active participation at the Autobahnmeisterei Inzersdorf in Vienna. 05th to 08th of April 2016: the Intertraffic Amsterdam took place from 5th to 8th of April 2016. ECo-AT has been successfully presented within the framework of the joint ITS-Corridor booth and two special sessions. 2016-03-22 14:12 | Eco-AT Article in "MAPzine"
The traffic management magazine MAPzine presents ECo-AT in an interesting article. Read more … Eco-AT Article in "MAPzine"